Natural stone is a popular choice for countertops. Stone is attractive, durable and a solid investment that will boost your home’s resale value. 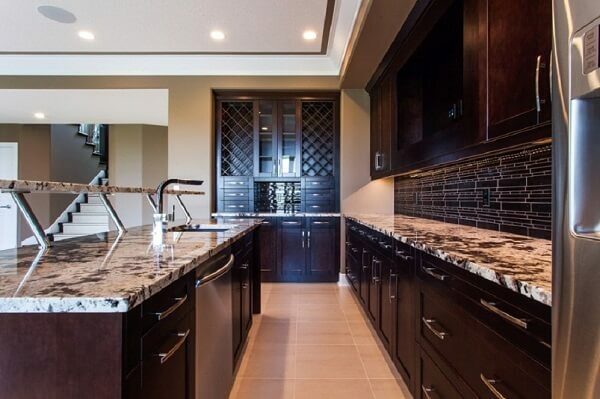 When shopping for Countertops in Edmonton, you’ll find stone countertop options including granite, engineered quartz and marble. All of these materials are aesthetically pleasing options and come in a variety of colours and designs. Because granite occurs naturally in the earth, no two granite slabs will ever be the same. If it’s a one-of-a-kind countertop you are looking for than granite countertops are a great choice for you. Granite is popular among homeowners and will be attractive to potential buyers in the future. If it is sealed properly, granite is stain resistant, very sanitary and its colour will never fade. Granite is also resistant to heat so you can place those hot pots and pans right on the counter without worrying about it! Learn how to clean granite countertops . Engineered quartz countertops are made with natural about 93 per cent quartz mixed with approximately 7 per cent resin to hold it all together. Unlike granite, quartz does not need to be sealed regularly in order to remain resistant to stains. You can choose from a wide variety of colours, textures and designs and will enjoy your countertops for years to come with minimal maintenance required. Marble is a high-end and classy choice that brings a touch of elegance to your kitchen or bathroom. It has a polished, timeless style but is not quite as resistant to scratches as granite or quartz countertops so you’ll have to be a little more careful with it. If you’re looking for something more low-maintenance, you might want to choose granite or quartz instead of marble. When deciding on a natural stone countertop, be sure to consider how much maintenance you’re ready to commit to as well as your budget. Consulting with a professional countertop company will help you find a stone countertop that will best suit your needs and home’s design style.